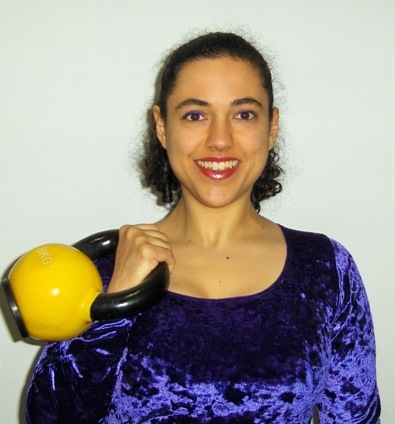 New clients constantly ask, “How can I work out in a New York apartment? I don’t have room!” One of the tools that can help is the TRX — bands based on gymnastics rings, but with comfortable padded handles. Though it’s wildly popular at gyms and studios nationwide, many people don’t realize TRX is something they can do at home, too. Small enough to hide in your sock drawer, and light enough to throw in your bag for a weekend trip, the TRX can help you work on strength, core stability, and flexibility. Even when just hooked over the top of a standard home door frame, the straps are strong enough to support users of all shapes & sizes, from athletes to the obese. 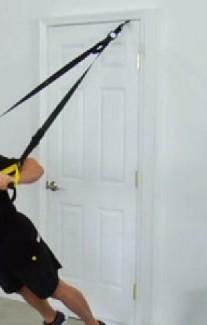 (I’ve had clients up to 400 lbs have fun with the TRX, without worrying!) TRX is also a great option for very tall or very short individuals who can never seem to find a comfortable setting on traditional weight machines. You can use the straps to make bodyweight exercises harder. For example, if standard squats are too easy for you, but you don’t have heavy dumbbells at home, TRX can let you transform your squat into a much harder single leg squat (aka “pistol squat”). But my favorite use of the TRX is to UNLOAD bodyweight exercises, making them easier. Can’t do a chin-up yet? Even beginners can do a TRX row, because they’re only lifting part of their body weight. Not ready for push-ups? With TRX, your pushup is on an incline, much more doable. Just getting back to the gym after months of rehab from knee surgery? You can use your hands to help you pull up from the bottom of a squat or a lunge.